I love these for limber adults or children and for extra setting. Here are the instructions from “Better homes and Gardens” from their “Spooky Forest Halloween Party for Kids” they have 18 fun projects. 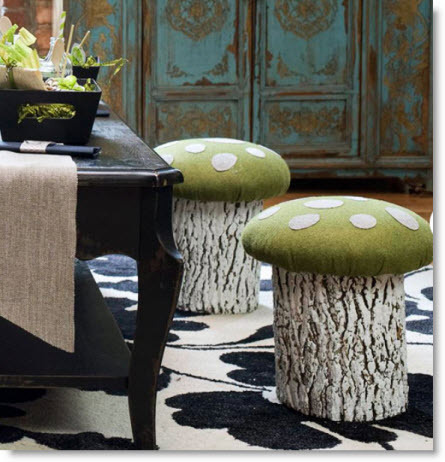 Serve lunch with toadstool seats set around a large coffee table to put party guests in a woodsy mood. For each stool, whitewash a log that is 10 inches tall and about 8 to 10 inches in diameter by brushing it with white acrylic paint, allowing the wood to show through. Let dry, and seal the log with clear polyurethane or another sealant. Center a 12-inch round wood plaque on top of the log, and drill a 3-inch wood screw through the top to attach the plaque. Use additional screws for added stability if desired. Cut batting and green felt into 15-inch diameter circles. Place a 2-inch-thick by 12-inch diameter foam insert on the plaque; top with the batting and the felt. Turn the stool upside down, holding the loose materials in place. Working around the log, staple the felt to the bottom of the plaque where it extends out from log, pulling it tight toward the center to hold the batting and foam in place. Cut 1- to 2-inch circles from tan felt or other fabric; use fabric glue to attach to the cushion top.